Nyuntam Aay Yojana: An announcement made by Rahul Gandhi, the president of Congress Party just before few days before General Elections has become a hot topic of discussion these days in India. Rahul Gandhi while addressing a conference on 25th March says that their party will launch a scheme of Minimum Guarantee Income (MIG) by the name of Nyuntam Aay Yojana (NYAY) for the poor families of India if they come in power after the general elections. He announced this Minimum Guaranteed Income scheme NYAY as “the final assault on poverty”. The acronym NYAY means justice in Hindi. Under this scheme, Rahul Gandhi said if they come on power their government will guarantee Rs.72000/- per annum to the 20% of the poorest population of the country. He added that that with this scheme they will bring each household in India above to the minimum income threshold of Rs.12000/-. It means the amount of Rs.3.6 lakh crores will be outlaid from the Exchequer to meet this promise made by the Congress party if they form government after elections. The total amount that is promised to be given to the poor families of the country is roughly three times the fiscal deficit of current year and nearly six time the Defence Budget. This is really a huge amount. This is the reason that this pre-election promise is a part of every discussion these days in the country. The amount promised to be distributed under this scheme is huge and thus make opposition and economists to ask question about the fiscal and economic feasibility of this scheme. Nyuntam Aay Yojana apply online:According to this scheme, the MIG benefit of Rs.6000/- per month will be provided to the 20% poor population (50 million families) of the country but identification of poor families in Indian is not an easy task. It requires intensive surveys and identification process in order to identify the poor families. It is a difficult task because the facts and statistics of poor and poverty in India keeps on dwindling, reason being country’s maximum population is involved in informal sectors where income keeps on changing. During elections, it is easy to make promises like Rahul Gandhi have made but at the ground level, it is a big deal to stand and to meet the expectations of the voters. Under the Minimum Guaranteed Income (MIG) promise, Rs.72000/- per year will be given to the 20% poorest population of India. With this MIG i.e. NYAY, families falling under the minimum income line will be brought to the benchmark of minimum income line i.e. Rs.12000/- month. 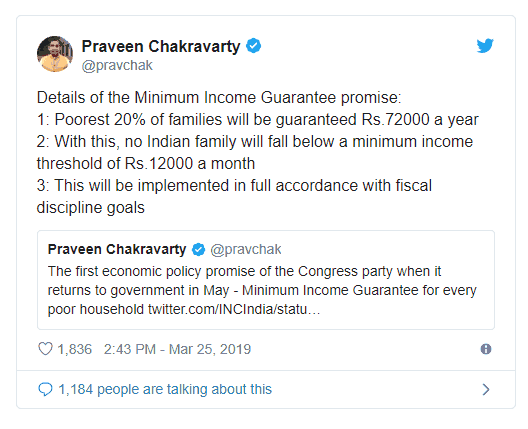 It means after the implementation of NYAY no, family in India will be earning less than Rs.12000/- a month. They have also said that NYAY will be implemented keeping all the fiscal goals in consideration. It could help the women living under poor conditions and especially those who suffer from domestic abuse and violence. It may provide a psychological benefit the poor of the poorest. With the monthly benefits of Rs.6000/-, they do not have to wonder or go through psychological trauma for daily earning. This scheme may reduce the psychological and financial burden on the beneficiary. If implemented and utilized effectively NYAY may include development of social, economic status and fulfillment of basic needs of beneficiaries. They can avail education and health services. However, implementation of NYAY is quite difficult and risky considering various economic factors but in case if it is launched then what could be its possible consequence and disadvantages? The unconditional and free money through this scheme can makes beneficiary lazy and reduce their intention to do work. No work means no payment of income tax which will ultimately affect the economic growth of the country. The fiscal deficit of the country will be affected. This may lead to increase in revenue and taxpayers have to suffer. Cut down of expenditure on other important projects and sectors. Reduction in Labor- The Minimum Guaranteed Income is one of the biggest threat to the economy if we talk about the labor force. The maximum no. of labor force or volunteer labor comes from the poor section of the country and with this scheme, there will be huge reduction in the labor force that will ultimately affect our economy. It would be not wrong if we say that the MIG and similar schemes will convert the asset (labor force) to liability for the country. There have been various examples around the world which shows that MIG schemes leads to reduction in labor. For instance- There are various western countries, where on an average 5% reduction in working hours of individuals have been recorded due to the implementation of such schemes. In case of India, the scenarios may get worst as the population is very high as compared to Western countries. This may also lead to less supply of labor and high cost. Sometimes, it is also observed that beneficiary use this money in the consumption of alcohol, drugs and other temptation goods instead of using it for education, health, and other necessary things. MIG schemes can be a reason for Degrowth of economy. The beneficiaries of this scheme will get income without making any contribution the society and ultimately to the country. It would not be wrong if we say that NYAY could be a financial burden for entire nation. Recommended Read: If you have applied for voter id for lok sabha election, then you can check your NVSP voter ID card status online. Click on blue link to view now. The bottom line is that a scheme is effective only when it benefits the actual needy and doesn’t backfire to the nation’s economy. And this case of arguments, counter-arguments and pre-poll promises the implementation of NYAY in Indian seems to be a very difficult task looking to the future perspective of this scheme in India. In a country like India where population and employed poverty is increasing with a tremendous speed, it is not easy to implement such promises (that require involvement of huge money and deep planning) with ease. Though Rahul Gandhi has said that they have consulted eminent economists from all over the world which also include Raghuram Rajan, the question still remains the same that “Whether implementation of NYAY is fiscally possible”? and if yes then how feasible and scalable it could be if Congress comes in Power? It is only the result of elections that would decide whether NYAY is actually going to be a “final assault on poor” or is just a fake promise by the party to pull voters. I wish if it can be granted..
NYAY scheme is imposible out of imposible, it’s a blind promise again, it’s not about the party, but as a citizen we need some possible solution though it can never be fulfilled..